Aubrey is my child with some sweet ambitions. And I literally mean "sweet" :) She says when she grows up she wants to be a "Mom" and also "own my own cupcake shop someday." She loves to decorate cakes and cupcakes. She loves to bake them too. She has fun perusing cookbooks and marking pages of things she wants to create with me. I love to bake treats too(I just have no patience for taking too much time decorating things like she does:) I mostly like to eat them. Hahahaha. So this works out very nicely!! :) She makes, I eat. 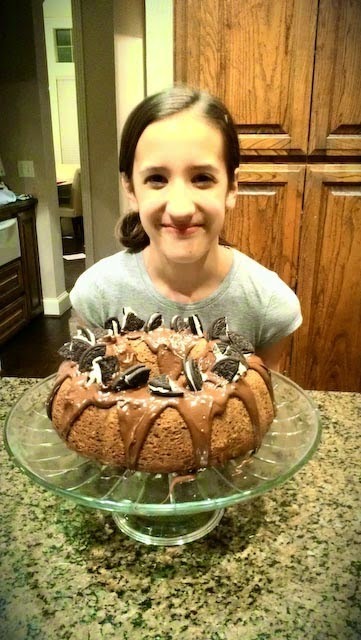 :) Here she is pictured with a chocolate oreo bundt cake we made one Sunday afternoon. It. Was. Divine. She did just about all of it on her own! And of course, from scratch. She is awesome. I hope her dreams come true someday. I love that all of your kids are so creative! Aubrey, you didn't show you baking skills when I visited last. What's up with that?! :) Just keeding. Seriously, that cake looks like heaven!